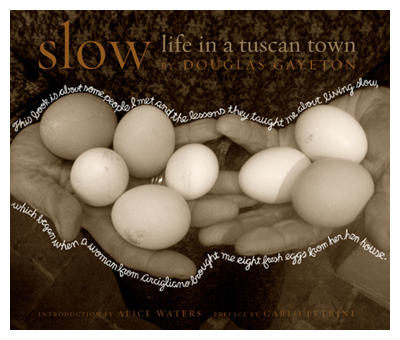 A groundbreaking photographic journey into the heart of an Italian town steeped in culinary tradition that is a tribute to the slow food movement and the everyday pleasures of food. Grano – one of my favourite restaurants – has been asked to participate in a continent-wide launch of this ‘moving book’ which has been dubbed a ‘flat film’. I’m selecting the wines for the dinner. To reflect the origins of the author’s Italian nonna from the town of Camposanto, provincia di Modena, Lucia Ruggiero-Martella has created a multi-course menu inspired by Toscana. Lucia will use fresh Ontario and uniquely Italian ingredients (Frescobaldi Laudemio extra vergine olio d’oliva, parmigiano reggiano, aceto balsamico tradizionale di Modena (‘real balsamic vinegar’). Cost: $125.00 includes all foods, wines, taxes & gratuities and, of course, a copy of this magical book ($62.00 value) with a signed commemorative bookplate (or $ 200.00 per couple, 1 book).